Why It’s Best To Start Them Young! People every day ask what the age limit is for our surf lessons and camps. A lot of people are worried their kids may be too young but we disagree. Starting your kids off in a lesson or camp of any sport at a young age is a great thing! The younger they are the better off they’ll be if they continue to practice. Just like learning a new language or activity such as playing an instrument, sports like surfing take a lot of practice. In the first lessons or period of learning, a person is able to develop the basic maneuvers and it becomes a second nature. This is not to say people can’t become great at something if they start it when they are a teenager or an adult but many people you talk to will admit that they wish they had started surfing or playing their sport when they were younger. Starting a sport or activity at a young age also helps build their confidence with trying new things. 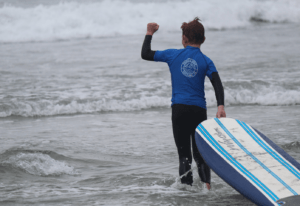 We encourage parents to support their young ones and make surfing seem like their idea. The less you force them the more they will want to do it. 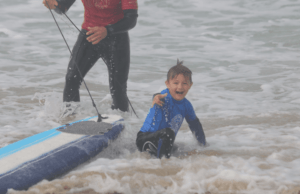 If you have kids that are a little hesitant or scared of the ocean, bring them by our tents and let them listen to our surf instructors tell their bad jokes and get the kids pumped and there will be no looking back. 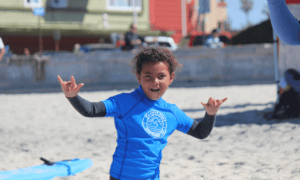 The bottom line is… Regardless of whether or not you want your child to grow up to be a professional surfer or not, they will have so much fun taking a lesson! Take a look at a few photos from some of our recent lessons!